This dish is ready in under an hour, but it looks and tastes like it took much longer. It features puff pastry shells filled with shrimp, shallots and corn in a kicked-up lemon cream sauce. Heat the butter in a 10-inch skillet over medium heat. Add the shallots and cook and stir for 3 minutes. Add the flour and cook and stir for 2 minutes. Gradually stir in the broth. Cook and stir until the mixture boils and thickens. Stir the shrimp and corn in the skillet. Reduce the heat to low. Stir in the heavy cream, lemon juice and hot pepper sauce and cook until the shrimp are cooked through. Spoon the shrimp mixture into the pastry shells. Sprinkle with the cilantro. 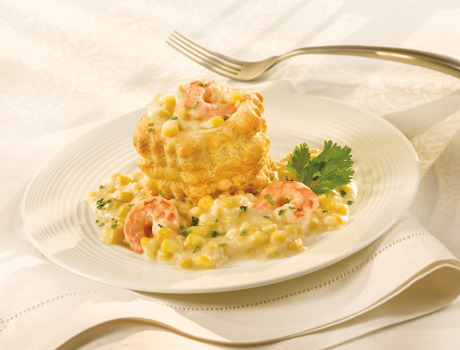 Flavor Variation: For Creamy Shrimp, Lobster & Corn Stew in Shells, reduce the amount of shrimp to 1/2 pound and add 1/4 pound diced, cooked lobster meat with the corn.